This idea for banana soft serve has been circulating for years. It’s not new, but I’ve turned a few people toward it this week with my Instagram picture of Jackson enjoying his morning ice cream treat and thought maybe some of our readers have yet to try it as well. The basic recipe is just frozen bananas processed in a blender. It’s magical! 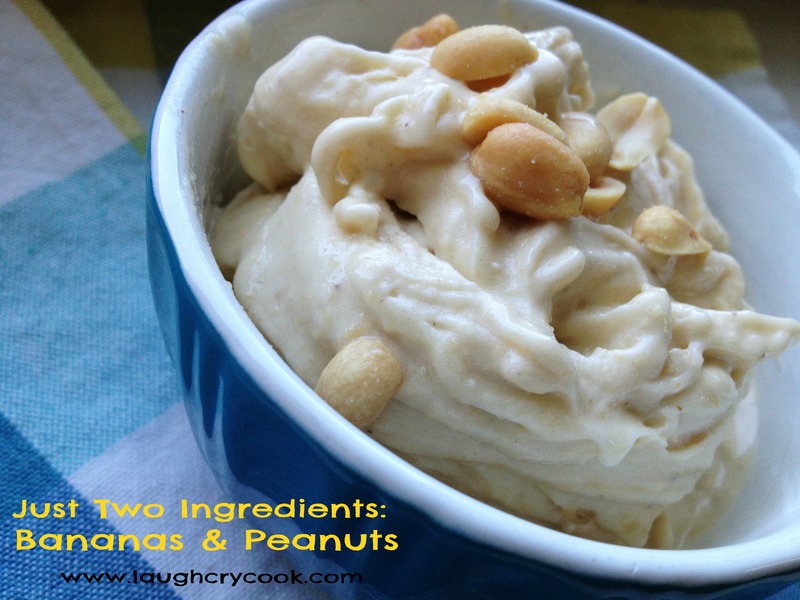 The bananas just whip right into a thick creamy soft serve that is delicious on it’s own. You can make all sorts of flavors: chocolate peanut butter, strawberry banana, cinnamon and sugar…wherever your taste buds take you. This version is one of my favorites. You can use peanut butter instead of peanuts, but I really love the texture and flavor from the whole peanuts. Ready in under five minutes, it makes the perfect healthy summer snack, or even breakfast. You’ll earn some serious cool mom or dad points putting a bowl of this in front of your kids first thing in the morning! 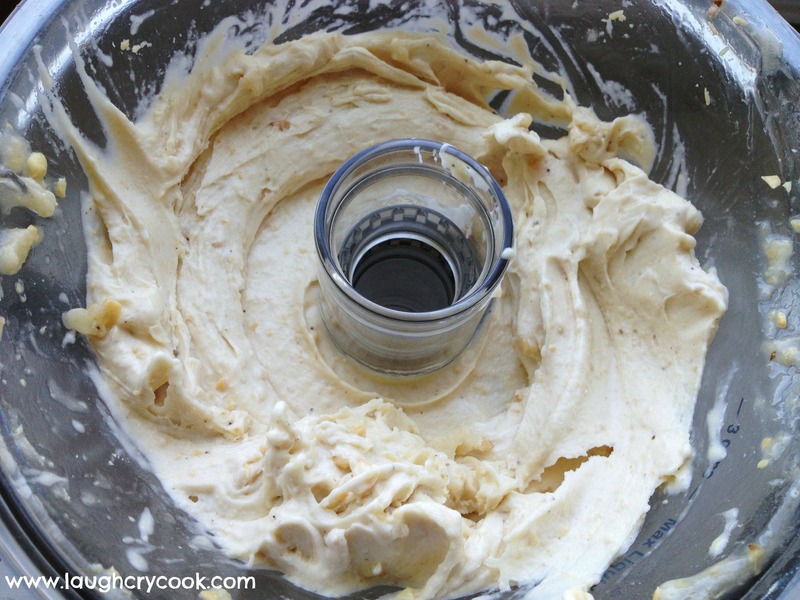 Put ingredients in a food processor and blend, stopping and scraping the sides as needed until it turns to the texture of a thick soft serve ice cream. Then stop. You don’t want to over blend or it will have more of a melty soft serve texture (not bad, but not as good either). Serve immediately with a few extra peanuts and another sprinkle of sea salt on top for some extra crunch. I’ve heard this does not refreeze well, though I’ve never had any left to try. 🙂 You can buy yourself a little time keeping it chilled in the freezer, but it’s best to serve right away. 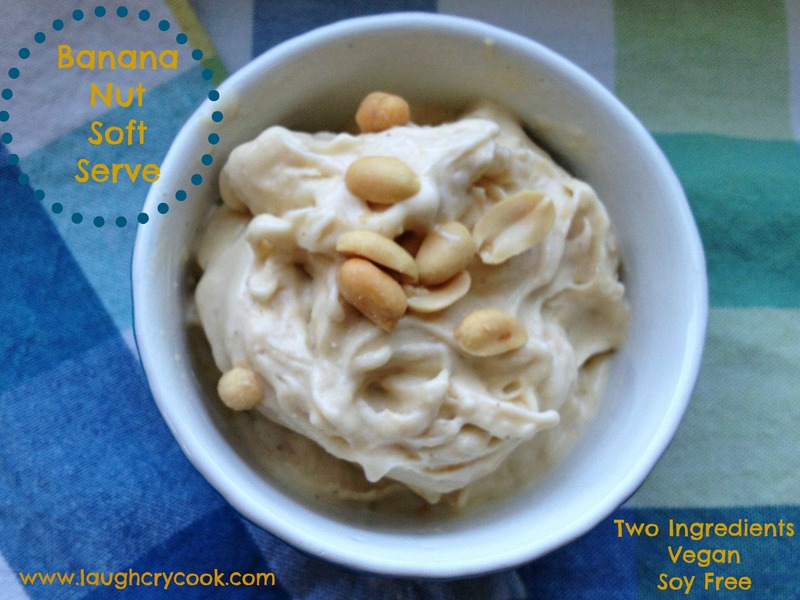 Have you made Banana Soft Serve? What are your favorite toddler phrases and phases? Zondervan, our publisher, has been so supportive of our book (coming out August 6). We’re having such a great publishing experience! 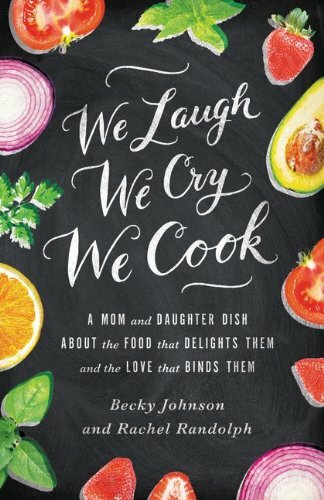 They just decided to do an audio version of We Laugh, We Cry, We Cook and invited my mom and I to record it. One of us will be recording in the studio most of the week, each of us having two 5-7 hour days in studio. Prayers for good health appreciated. The following week I’m heading to Colorado (with Jackson in tow) to join mom for a photo shoot for a major Christian publication. We’re so grateful for all the encouragement and support we’ve received…and for our fabulous readers at the blog. We also got all of the endorsements in for the book. Wow! We are floored by the generosity of our fellow authors. Click on the picture of the book above to read the endorsements and find lots of knew authors to friend and follow.